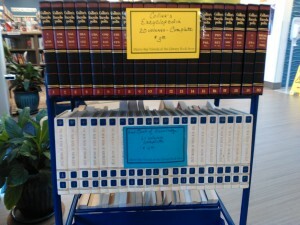 I was browsing in the books for sale nook in our Morro Bay Public Library and I spotted these two beautiful sets of encyclopedia for sale. The Collier’s, 20 volumes, $3, and the New Book of Knowledge, 21 volumes, $4. So sad. So distressing. I thought I’d weep. How come for sale and so cheap? Victims of the Digital Age! Specifically of Wikipedia, Google, Yahoo, Bing, other search engines. So that gold mine of knowledge, and yes, pleasure, can be tapped online with just a few clicks. And for free. Big, hefty volumes like these are no longer needed , perhaps just to gather dust in an ignored bookcase. That’s why these two sets were discarded, I’ll bet. Now here they were —full, beautiful, obviously pristine sets—waiting to be taken home and just for peanuts. Of course, the Britannica, and perhaps also the Collier’s and the Book of Knowledge still exist, but only as websites. You pay to subscribe, and it’s affordable, I guess, and you can type in whatever you’re searching for, or initiate a simple search, and presto, you’ll be looking at in on your screen. That’s absolutely true. But it just ain’t the same, at least to me. And I’m sure to others getting up there in years, too. We love those big thick volumes. Now a personal snippet, if you don’t mind. Some 12 years ago, my son Mark, now a PhD academic at the University of Wisconsin/Madison, and Stacie were getting married. She also teaches there. By the way, married in Colorado. I was in France. Of course I rushed back to make it. Like any father, I wondered, What would be a nice present? It had to be something meaningful. And practical. Those where my priorities. But I also had one more. Whatever the gift, it also had to have a certain symbolism. Had to mean something special. Had to quietly proclaim something important about this family. Well, I let those thoughts bang around in my head. Finally, inspiration hit me: a print edition of the encyclopedia Britannica! Perfect! After all, Mark and Stacie were ardent readers. They were curious about so many things in this great big world of ours. And sure, they liked sports and enjoyed a good social life and all that, but they had a strong intellectual bent, which of course is why they were doing the work they’re doing. Sure, my gift was certainly a very strange one, no question. I admit that. Have you ever seen a wedding gift like this, or heard of one? I’ll bet you have not. As it turned out, Mark and Stacie were delighted. I worried a bit. Who wouldn’t? What I came up with was so unusual. But their hugs and thanks quickly put me at ease. But as I’ve mentioned, the Digital Are is here. I knew it was coming. But even then the Britannica came with an online edition. And I subscribed to it for them. I knew that would be more practical on a daily basis. As a matter of fact, going online is a big part of how they earn their living. Well, of course they’re totally immersed in the Digital Age. They depend on it, couldn’t live a day without it, know how to exploit it. They use it for work, use it for everything. But the Britannica is still right there, in its tidy corner on the varnished shelves, a couple of steps away. Sure, they’re constantly looking something up, confirming something, in fact often contributing something. But online. Always online. Never in the set itself. I understand. Who today would have the time and the patience and the inclination to stop everything, leave their desk to go to that bookcase, pick out the right volume, flip to the right page, sit down and read what they’ve finally turned to, make notes, and then put the volume back in its proper place, Hey, I wouldn’t either. I enjoy the Digital Age too. I see it when I visit. I get pleasure in seeing it. It fulfills everything I hoped for this young couple so dear to me. I don’t feel bad. Don’t kick myself for having made a bad choice. Just the opposite. I still look at it as more than a fantastic compendium of facts and figures and photographs and paintings and drawings and tables that embrace all mankind. A precious repository of learning and knowledge and culture acquired bit by bit from all corners of the world over centuries of accomplishment and progress by gifted people all over the world. Oh, one more thing. Mark and Stacie have little Annalivia now, and little Lincoln, and I doubt these two will ever pick up a volume as more than just a curiosity. They’re growing up digital, of course. But maybe as they grow older, and when they leave home, they’ll think of those impressive volumes as a work of art, too. Especially if Mark and Stacie explain, and I’m hopeful they will. I know you may shake your heads, but I look at that set as, yes, a true work of art in the home of Dr. Mark and Dr. Stacie LaPlante. A work of art that says so much about this household and louder than any words possibly could. I must tell you I had a set myself once. In fact, two sets. But in moving from one home to another over the years, each one smaller, and with me now 3,000 miles removed, many things had to give. So painful. It’s with a sad heart that I had to find a new home for those two sets. But again, there was no market. I donated them, just as I’m sure these two sets at the Morro Bay Public Library were donated. I was buoyed by the hope that my sets would find an appreciative home. I never found out. Surprise. I just had a new idea. I’ll go back to the library in the morning. I’ll see if one of those sets is still available. It would be nice to have it close to me, by my favorite lounge chair, where I read and write and ponder. As a precious work of art, don’t you know?